Discussion in 'Electric Instruments' started by billyjk, Feb 6, 2018. - Is the Experience a good place to buy? I've attended most years since the start, and it might be the best single place with the most 594's to compare. If you made your purchase there in the past, let me know what your "experience" was like. - Is it likely that I'd find a 594 Singlecut with all nickel hardware at the Experience? Visually, the all-nickel 594's look better to me, but I don't know if the all-nickel option is popular enough for it to randomly show up at the Experience. -Yes, Experience is a great place to buy! I did so last time around. -You never know what you might find...the Experience edition guitars and amps are usually pretty wicked! +1 - Experience has been a wonderful place to buy. The only real risk is running out of hands to carry everything. But if you come in with a cart, people just give you dirty looks. Come to think of it, you can't win - just stay away from the sales area and let the rest of us deal with it! Is nickel hardware a popular option on the 594 Singlecut, therefore I am likely to find one at the Experience? Or does it tend to be an order-only thing? Experience is a great place to buy, but if you aren’t sure what models you are interested, you might want to try them somewhere a bit calmer before you go. And as Alan noted, take a friend to help carry your bootie. This confuses me. How did you manage to attend multiple Experiences and never feel compelled to buy? What witchery is this? dogrocketp, ScottR, rmg471 and 1 other person like this. Nickel is standard on non-10 guitars, hybrid is standard on 10 top guitars, and gold is standard on Artist Package. Seems like Wood Library editions often stick with nickel (or some even use smoked chrome) even with the higher grade tops, but none of those are hard fast rules. It hasn't been easy! Worse yet, my son owns a PRS! It's just that I've been brought up on vintage guitars from the time I was a kid, and while I've always appreciated PRS's excellent build quality and amazing playability, I've just organically connected with old Strats, Teles, Les Pauls and 335s. The 594 Singlecut has really caught my attention, and by all reports, it's Les Paul vibe might really work for me. I will definitely get out to some local stores to spend some time with the 594 Singlecut prior to the Experience. If I connect with it as I think I may, the trick will be to hold out to see what the Experience has to offer. Although I haven't purchased in the past, it's pure insanity to walk down those endless aisles of gorgeous instruments - it's really a great place to get the pick of the litter. AtomicBlaze and dogrocketp like this. Thanks for this insight Garrett. None of the amazing guitars I've owned/still own have the exotic look of a 10 top, and I find that I am typically not be drawn to over-the-top grain patterns, so I might be perfectly thrilled with nickel on a non-10 top 594. We'll see. Thanks again! I'm with you, but I ended up falling for a 10 top 594. My Custom 22 is a goldtop. I like them both equally for their different vibes. FWIW on the vintage thing, Robben Ford has been playing the SC594 lately and he's also one who had said he tends to prefer vintage instruments as well. dogrocketp and Phil M like this. Geez - Robben has been one of my favorite players over the years. I looked up a YT video and he sounds awesome playing the SC594. dogrocketp, garrett and Phil M like this. Yes; yes. The 594 is a very popular model, so dealers will likely be bringing as much variety as they can, if they're smart. Not everyone wants gold or hybrid hardware, and they should know it. But it also depends on the variety of hardware that PRS provides them, so yes, there is a small chance there won't be any nickel hardware ones, if demand outweighs supply. Thanks Dusty! It's a wait-and-see kinda thing I guess. Well I did a little shopping today, and the result was mixed. At my local GC, they didn't have any SC594's so I tried a double-cutaway 594 just to see how I would like the neck and overall feel. Both were quite good! Although the action was far too high. I was really surprised to see that the neck angle on both DC594's in GC required the bridge to be seated flat against the top in order to get the action on the treble side closer to playable. 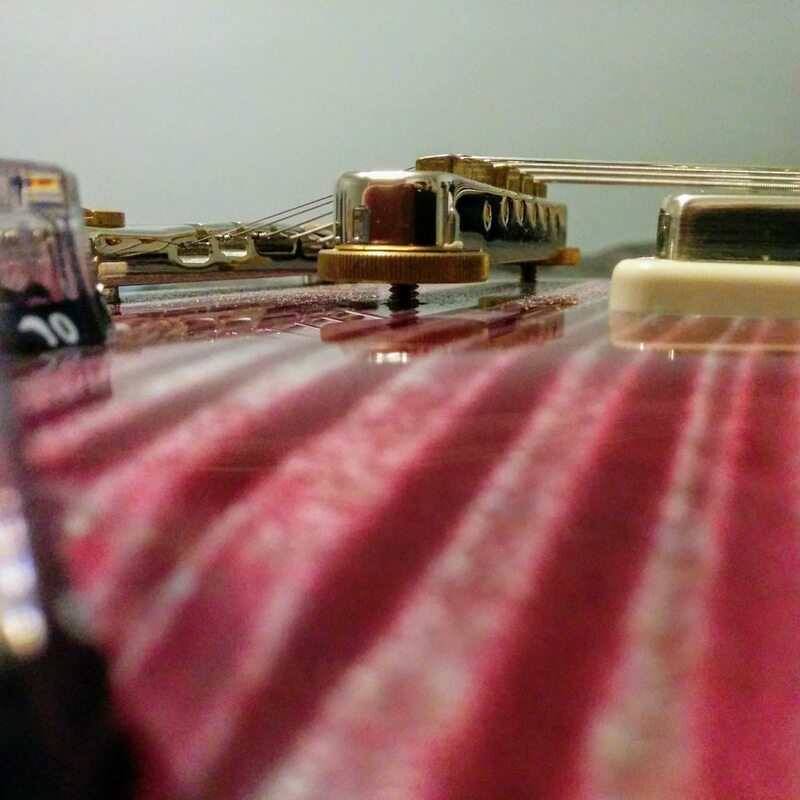 I know to look for this issue with Les Pauls and 335's, but I didn't expect it to be an issue with a PRS - given their reputation for build quality. No way I would buy either one of the PRS's I saw today. I hope that this was just a fluke. I plan to go to another local shop to play more 594's, and hopefully a SC. That doesn't sound right at all. I have gaps under the height adjustment wheels of 3/32" on the treble side 1/8" on the bass side. I'm gonna blame your experience on GC. Could you post a pic? Thats very little as well I believe. Oddly, the one concern I had with my new one is very little adjustment under the bridge. There is some, but not much. I am familiar enough with PRSs to know they rarely ever need adjusting, but it is a bit odd. Very little neck angle. I take it thats intentional. Here ya go. 3/32" is a ton of room, actually. I haven't touched the height, so as far as I know this is how it left the factory. 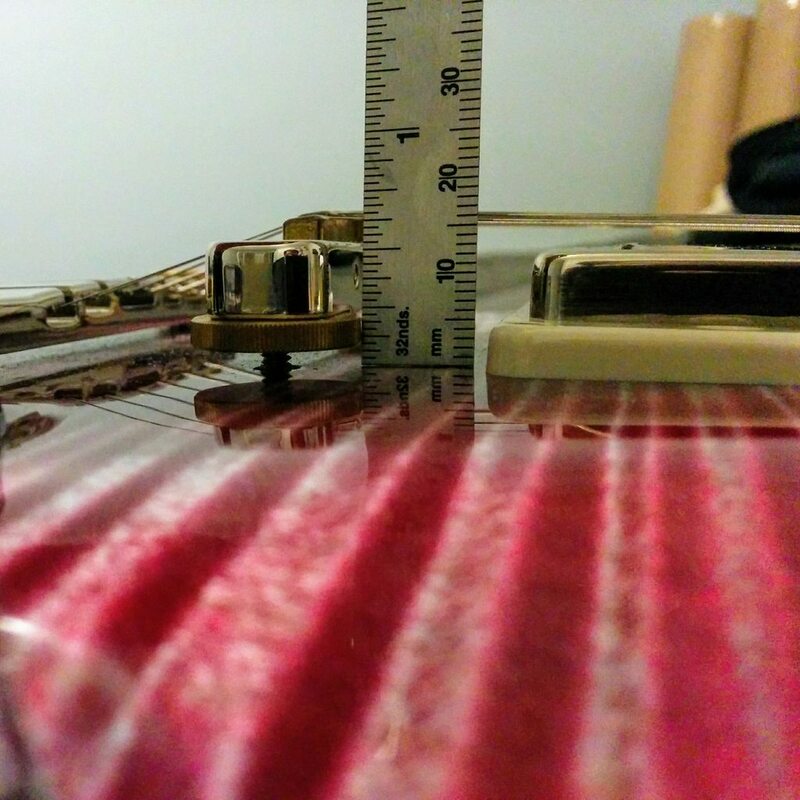 My action is slightly higher than the PRS recommended 1/16" treble and 5/64" bass side at the 12th fret, which I'm sure I could easily correct with a little turn on the truss rod. The adjustable wraparound that was on my HBII was much closer to the body. There was hardly any daylight at all beneath the post on the treble side with that one. g.wizz, grausch and rmg471 like this.